Are these a one time thing, or can NA expect to see these dungeons pop up more than just this one time? Sakuya is a 20% gravity, and if ZeusDra has full HP, that means 100mil x 20% = 20million, and it would get nullified, no? I believe the shield absorbs anything *above* 20 mil, but I could be wrong. You are horribly mistaken. Even the 20M damage will get nullified,that’s why most JP builds have a Beorc to enhance the board and deal 10M to start using Sakuya freely. Hey experts, can you help me with my potential team? Odin ?? Dunno what to do about this slot. . .
Any thoughts out there would be appreciated. thanks! Hey all! I wanted to give a HUGE shout out to mantastic for coming up with the turn combos and the hints for this dungeon! Thanks to you, my brother and I BEAT Zeus dungeon!! Congrats to you and your brother in view in Zeus Dragon! Glad to hear you were able even use a less than conventional / popular team. Well done! Those of us without ALB are wondering if it will work with Perseus as lead. Erm…. Your dmg may be too low for the same strategy and it can get dodgy. However, if you have beorc instead of famiel poke and a freyja instead of yomi it may work..
Alas… Alb…. So elusive. I have the rest of those cards so it’s frustrating! His dungeon is pretty scary! If we both have Hera Beorcs then the gravities should bring Zeus Dragon down to under 39%, and one swipe easily finish him off. Hera Dragon is here tomorrow! I would really really like to get one for my YomiD. Thank you! I also would love a Hera for my Yomidra. 1.He will bind all dark cards but you don’t need Elysiums or your flex and can wait out the bind. 2.Pop Neptune as soon as possible. Verche has no status shield. Grind/poison him down while gravitys charge. Try to clear all jammers to avoid his hardest hit and heal up every turn. 2. 2nd player pops gravitys then begins grind since leader skill can now reduce incoming damage. Make sure to 7+ combo to not heal her. When she is getting low pop the full board change, as well as a Neptune for 2.5x enhanced damage. 1. Grind down matching water and dark while healing up. 2. When low enough pop gravitys, board change and Neptune. 2. Easier said then done. It is also not the fastest and I’m sure you will come up with something quicker then this, but all of these cards are within reach for me. One thing about this build…do element resists stack or multiply? If you have 2 leads that are -%50 damage each it becomes -75% and not -%100. But i have seen videos where 4 Elysium resist all dark damage. Are the Awoken skills more effective then the leader skills? ie could the team get away with 1 Elysium and 1 Shangri-La and the other slots can be better subs? I am not 100% sure on the resist question as I have never used these types of teams, but I am certain you should be able to hit 100% damage reduction with enough awakenings. It sounds like it could work, but that does depend on how the resists work. Also, you will probably never be able to gravity Hera as it will deal more than 2m damage and heal her. If you have BOTH leader and awoken skills, they are multiplicative. 75%, 75% and 30% DR. 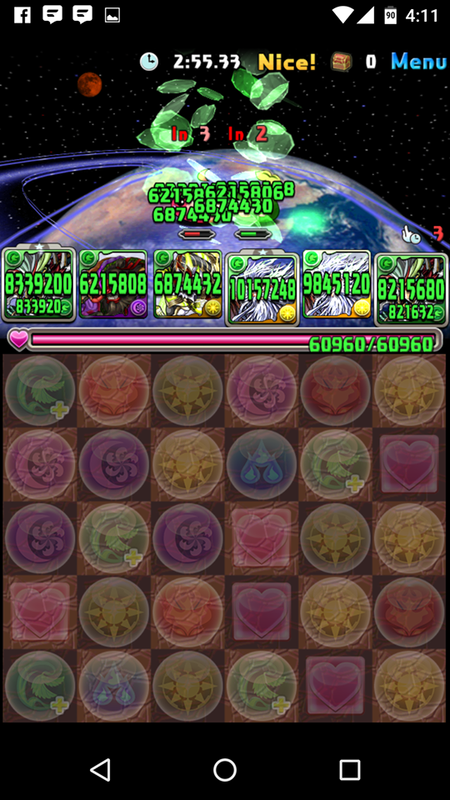 So you would calculate the damage reduction as: 1-(0.7*0.25*0.25), or 95.6% DR.
A mostly farmable and easy, though cheesy way of beating her dungeon (which is probably the easiest Radar Dungeon) is to use a Goemon Team. You can basically sweep every floor, but you’ll need a Sylph-active or Raphel-Active vor Awilda. Noah herself isn’t that difficult since they key of the team is using the blue stone dragon, Mythril. Noah will only bind your subs and the resistance will make stalling the 99 turns very easy. Then just just two ZeusHera Gravitys, switch the leaders back and you’re good to go! There’ll be one team for the offensive part and one team with key utility. Mythril should be on both teams, since this makes stalling much easier! I hope this is mostly understandable, I’ll develop a team, if there’s any interest. Yamato Takeru should be on the last sub slot, if unlucky skyfalls appear. If you have Beach-Goemon, you can also use normal Mythril. Delay on Sakuya has to be under 11 turns. Akechi D/D, Eschamali, Haku D/B, Haku R/D. It give me 3 differents E.orb to give an extra burst or a moderate attack on absorb shield if not using dark orbs. I would suggest using D/L Akechi for additional orb enhances as the rows have no value for Yomi Dragon overall. For Hera Dragon- we took Revo Hades; inherit ceres on dmeta. Basically, we each took a heartmaker (panda), and monsters with dark rows, orb changers. Dmeta, panda, awoken luci, zuoh. Instead of luci and zuoh, husband took dvalk x 2. Pop gravity, one shot verche. Hit ceres into dark immediately, then chip down until you can gravity under resilience. Kill. Basically just grind Hera dragon down. She can’t one shot you. For those of you/us who are maybe missing key cards or inherits to do Mantastics build for Hera and can’t field a viable team of your own and want to be able to get their Yomi D evo’d…then here is the super duper solo long long long cheese clear that is a resistance/resolve team. I mostly mention this as right now PADZ collab is on and you could pick up your 4 Elysium. The video is sped up so i have no idea how long it actually took, but you have to wait out 999 turns. Hey Mantastic – thank you SO much for putting this up and for updating with your Hera strategy. I ended up having to stall quite a few turns both because my ZHera wasn’t max skilled and because I had to reverse teams 1 and 2 due to timing (my main account which had the requirements for Team 1 was the first guerilla hour and I missed your post while the hour was on so had to wait until it was my alt account’s turn, but that one only had the reqs for Team 2 haha). However, both accounts are now the owner of a shiny new Hera dragon. Congrats on your new and shiny Hera Dragon! Thank you again for your Hippo dragon strategy! I unfortunately can’t build the teams suggested above but I have a pretty solid Krishna or Yamamoto teams and can inherit a Raphael on team one. Do you think those would work? As always, much appreciation for all the effort you put into your blog and supporting the PAD community! I think i am missing something for Hephaestus Dragon build(not that i have what i need, just curious). How do you bypass the 50% Resolve on Apollo? What part of this knocks him below 50%? Player 2 has to get the kill so that they can take the preemptive hit of Skill cooldown. I feel like ‘Player 1: 1 Combo’ has to be the hit to take him below 50%. Ok, so there are actually 2 more turns in there? Player 2: Sun Quan and a burst. player 1: Combo but do no damage if Resolve was hit. Player 2: Finish him off; last orb change for burst if needed. Turn 15 passed/16: Activate Sonia’s skill and enjoy the gold egg. Give yourself a high five, you earned it. P.S. – It always irks me when I have the “right” cards but in they’re in the wrong accounts… but just goes to show there’s more than one way to solve these dungeons! Used the Sarasvati guide for Heph and it worked great, still had the Ryune instead of Karin version but no issues there. We 0 stoned it a couple times relatively easy, thanks for the guide! More seriously, I’ve had difficulty finding good partners for these dungeons. I don’t need the drops for upgrades so I think I’ll hold off on stoning them if, as you say, they’re going to come around regularly. The mis-labeling on PADx kind of ruined my plans lol.